How about an affaire de coeur with a singularly gorgeous cold-molded mahogany beauty? I’m a romantic at heart. And quite frankly, I believe that most true boat lovers are similarly constituted. Yeah sure, most of us appreciate top-of-the-line mechanicals, wallet-warming operating efficiencies, calm-inducing dockside maneuvering characteristics, and other nuts-and-boltsy features. But if a given vessel doesn’t, in a sense, “sing” to us as she toodles on by, we simply lose interest, entirely missing the unrivaled excitement we’d otherwise enjoy if she were simply and classically beautiful. 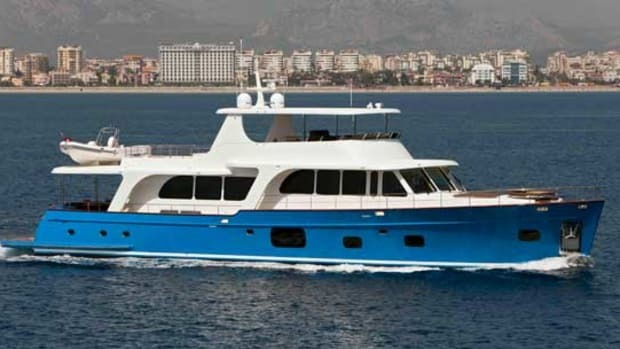 Consider Vicem Yachts’ new Turkish-built, cold-molded mahogany 54 IPS express-type cruiser, for example. Talk about classically beautiful! 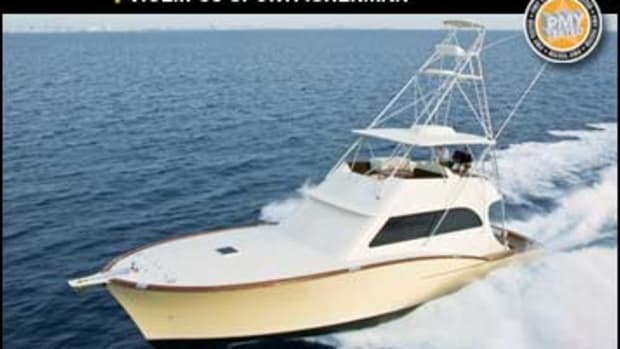 Just a few weeks ago, behind Vicem USA’s offices in downtown Fort Lauderdale, I’d barely gotten the dang boat in my sights when the sweet strains of persuasion became so intense that, for just a moment there, I started thinking about selling the house, the two cars, my cherished Betty Jane, and buying a 54 myself. What a gorgeous profile! Her bow seemed comparatively low, only slightly flared, but dramatically raked, and her sheer swept aft in a seductively concave and ever-so-downeasterly way. 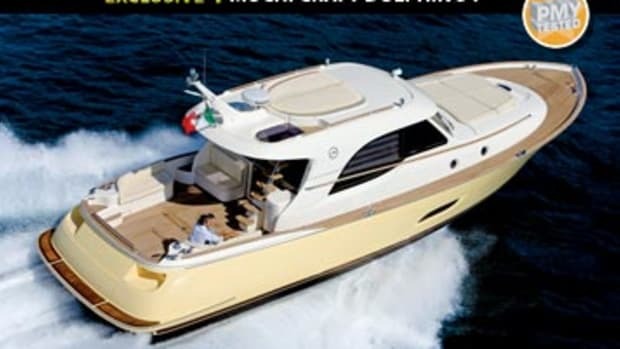 The lines of her superstructure were die-straight, again in keeping with the angular good looks of the boats that have graced the rocky shores of New England for ages, and her cabin was stationed well aft, an arrangement that engendered an overall impression of sleekness, charm, and glamour. Reflections of her starboard hull side, sporting an impeccable coat of dark-blue Awlgrip, wavered upon the dimpled surface of the New River. 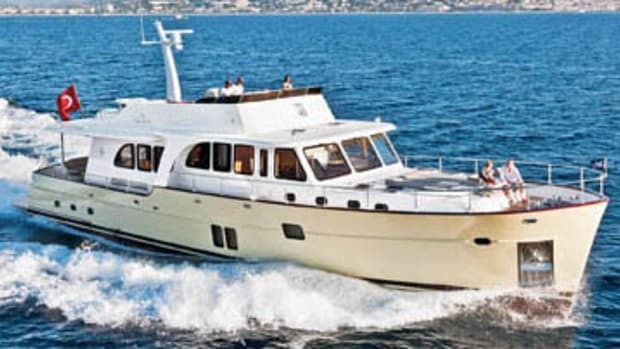 My infatuation only deepened as I stepped aboard, giving short shrift to the teak-planked cockpit, a noteworthy spot if only because of the profusion of curves and shapes that adorn it. While each is a dead ringer for a creamily gelcoated chunk of fiberglass, in actuality, all of them are composed of laminated mahogany with an overlaying scrim of E-glass, West System epoxy, longboarded AwlFair epoxy fairing compound, high-build Interlux primer, and white AwlCraft 2000 acrylic-urethane paint. 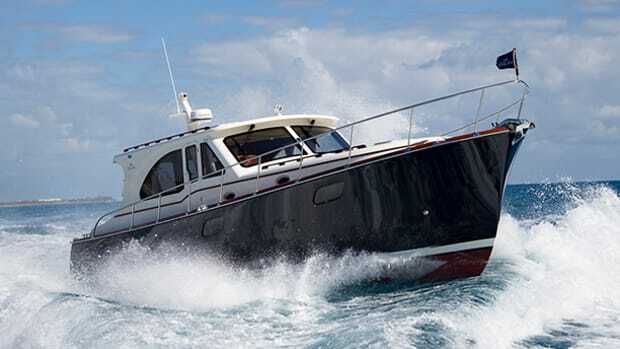 Shortly after opening the door into the saloon (with its ample L-shape lounge/dinette area to port and starboard-side helm station), I was a goner. The ambiance was pure Casablanca, with maybe a little Captains Courageous thrown in. Virtually all the Khaya mahogany cabinet doors were louvered from top to bottom—though there were a few half-louvered wannabes—with raised-panels supplanting slats. Inlays of Wenge decorated the perimeter of the mahogany deck, carpet-fashion. Every single joinery juncture, no matter how insignificant, was blind-fastened so no screws were invisible. And over the wood was a flawlessly applied patina consisting of ten coats of Interlux two-part polyurethane sealer (with soft sandings between each coat) overlaid with four layers of Interlux Gold Spar satin varnish. The lower deck pretty much replicated the nautical classicism I’d been so taken with in the saloon—oodles of louvered doors (with a few raised-panel types here and there), mahogany decks with the same pattern of inlays, and blind-fastened joinery virtually everywhere. There was one bit of quirkiness about the layout, though. While the 54’s three-stateroom, two-head arrangement seemed conventional in most respects, with a VIP forward, a port-side master aft, and a guest to port, the galley (situated across from the master and bordering a narrow hallway not overly endowed with ambient light from ports and hatches) was laid out in an exceptionally longitudinal way. Except for a bulkhead-mounted Bosch oven under the electrical panel, the appliances were integrated into a single, straight-shot marble countertop. A sensible setup? 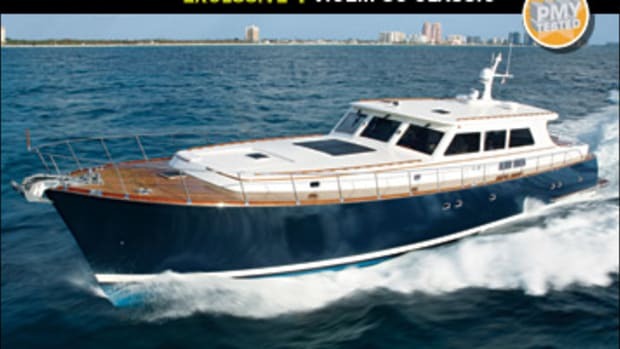 I don’t think so, particularly when compared to U-shape galley arrangements that help the cook stay steady in a seaway and offer appliance access that’s considerably more convenient. The 54’s offshore performance was also a little mixed. 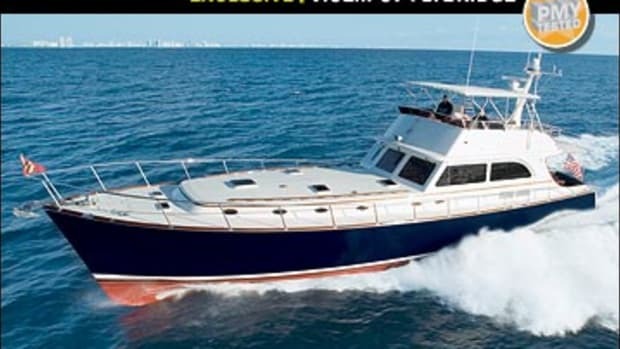 Although she comported herself steadily and stably in the four- to six-footers that were harrying the depths east of Port Everglades Inlet, there’s no way I’d characterize her as a dry boat. 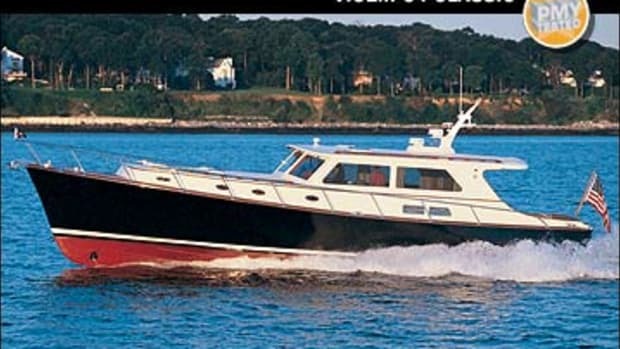 Certainly, she had no trouble comfortably slicing sizable waves with her modified-V hull, even at speeds well over 20 knots (23 mph). But the downside was diminished visibility when big slugs of seawater would periodically obfuscate the windshield panels, despite the fact that I had the wipers going great guns. And then, in shallower, calmer Intracoastal waters, I discovered that I could not see over the bow for a few seconds while throttling the 54 out of the hole, most likely due to the proximity of both her steering station and her propulsion package to the stern. 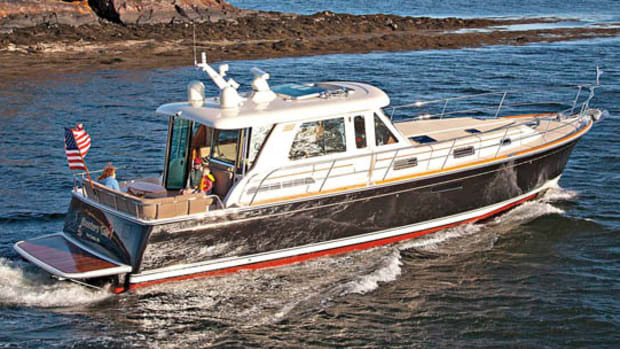 Dockside handling went smoothly, except for one small detail—the 54’s joystick control system exhibited a frustrating delay of a couple of seconds, a deficiency the Vicem rep onboard said Volvo Penta techs would most likely address in the near future. Otherwise, I spent an enjoyable half-hour in Port Everglades Harbor maneuvering my test boat with the joystick control installed to the left of the steering wheel (there was another joystick in the cockpit), an ergonomically savvy placement that facilitated comfortable manipulation with either hand. Large windows around the helm afforded excellent visibility while I walked the boat sideways, up- and downwind. A door to starboard promised crew instant access to the weather deck during starboard-side tie-ups. The 54’s white-Awlgriped machinery spaces constituted my last stop aboard. 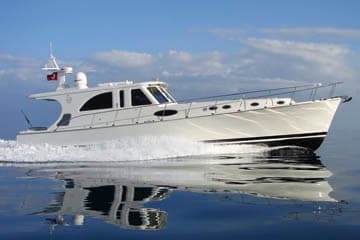 The engine room itself was spacious (with stoop headroom of 4&apos;1" and an ample 2&apos;7" between the mains) and provided excellent access to the ancillary equipment, as well as a simple, easy-to-understand layout, in large part because Volvo Penta’s IPS units so elegantly consolidate engine-related systems. A utility room just forward of the ER contained a phalanx of Cruisair compressors, a Matrix desalinator, Isotherm water heater, Victron Energy battery charger, and maintenance-free batteries (in custom painted, epoxy-coated battery boxes), as well as sight gauges for both fuel and water tanks. Lights were LED exclusively. I made an aprs-test visit to the nearby Bimini Boatyard for a late lunch. And while waiting for my chow to arrive, I indulged in a little reflection. Certainly, Vicem’s 54 IPS was a tad wet, although she also seemed fast and stable. And her mechanicals and electrics looked solid, even by comparison with what I’ve been seeing lately on American-built boats. But what about that gorgeous profile? The one that had so deeply twanged my heartstrings earlier? Well, let’s just say that its mere memory got me so tangled up in La-La-Land again that I almost let a big ol’ hungry sea gull steal my grilled cobia! Vicem Yachts (954) 713-0737. www.powerandmotoryacht.com/vicem/. When I first spotted this gizmo in our Vicem 54 IPS test boat’s engine room, I had no idea what it was. But after I’d studied the thing for a bit, a light dawned. 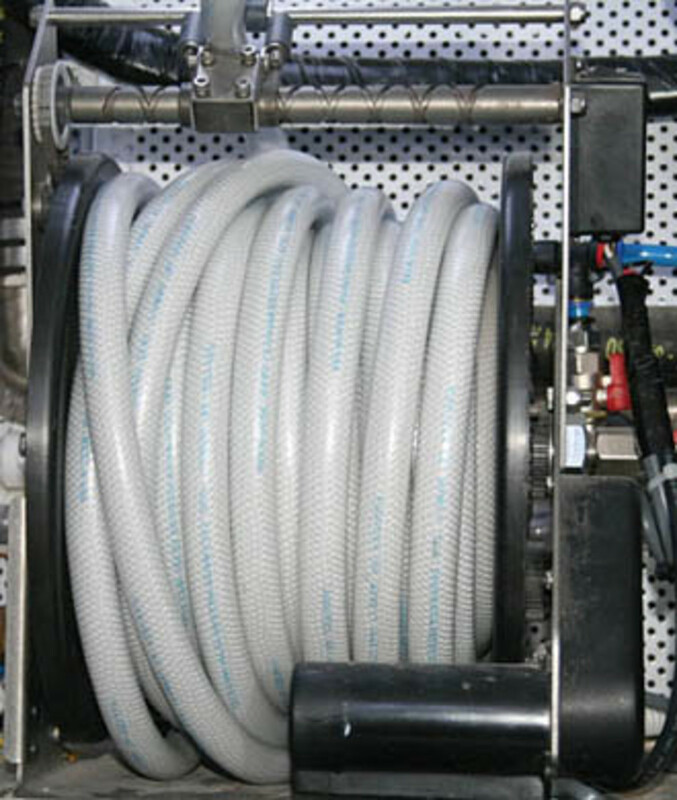 Hmmm—a coil of washdown hose rolled up on an electrically actuated spool? Aha! This was the Glendinning Hosemaster I’d heard about. And what a great idea for those of us who know how difficult coiling up a hose can be, particularly in cold, hose-stiffening weather. Add a Hosemaster to the mix and you’ll continue to pay out hose manually but retrieve it with push-button ease. There are two versions, an electrically activated one that stores 35&apos; of half-inch hose (about $595 retail) and a spring-loaded model (about $149 retail) that handles 8&apos; of the same stuff. Cool! —B.P. Glendinning Marine Products (843) 399-6146. www.glendinningprods.com.